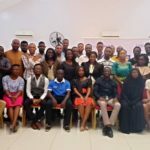 The 2018 Cohort of the ScaleUp Lab Agribusiness Accelerator Programme officially came to an end on Friday, September 21, 2018. 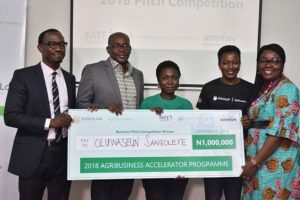 The Accelerator programme which was funded by African Capital Alliance Foundation and Accenture Nigeria was closed out with the Agribusiness Demo Day and Business Pitch Competition which provided a unique platform for the entrepreneurs to showcase their products and services and pitch to investors and funding partners. 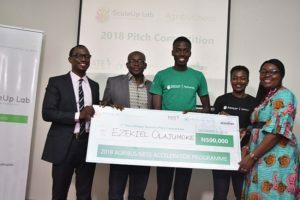 The overall winner of the pitch competition was Oluwaseun Sangoleye (CEO, Baby Grubz) who received a prize award of NGN 1,000,000. 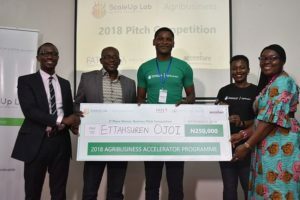 Ezekiel Olajumoke (CEO, Nectar Green Snails) and Ettahsuren Ojoi (CEO, Konet Mills Limited) also emerged as runners-up and received prize awards of NGN 500,000 and NGN 250,000 respectively. 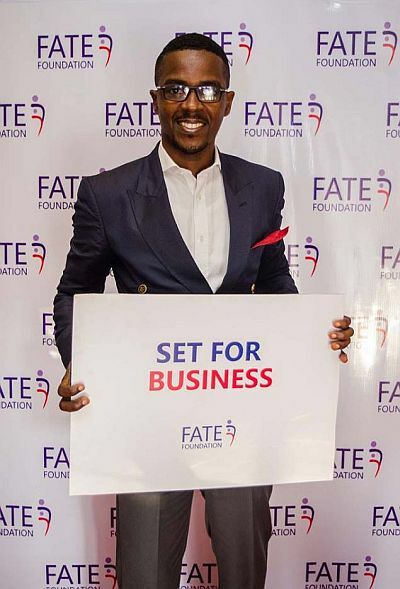 The ScaleUp Agribusiness Accelerator Programme by FATE Foundation is a unique accelerator programme aimed at providing targeted support to growth stage high-potential Nigerian agribusiness entrepreneurs who are looking to scale their businesses, expand their market reach and attract potential investors and strategic partners. 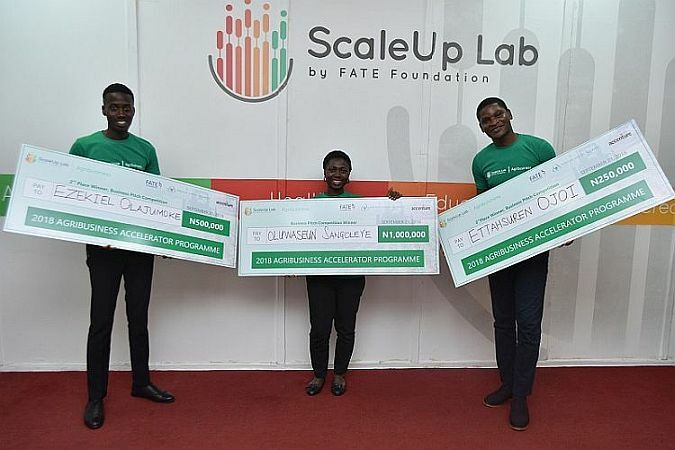 Over 345 applications were received from all 36 states of the Federation and through a very thorough screening process, top ten (10) entrepreneurs were selected as finalists and admitted into the 2018 ScaleUp Lab Agribusiness Accelerator. 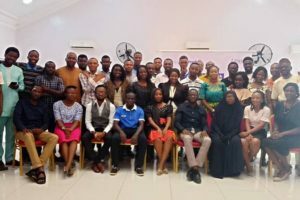 The 10 entrepreneurs are: Adewale Ajao (Oyo), Celina Onoja (Abuja), Courage Agbonlahor (Benin), Ettahsuren Ojoi (Rivers), Ezekiel Olajumoke (Ogun), Friday Ejam (Lagos), Gift Udoh (Rivers), Ikechukwu Amajuoyi (Rivers), Oluwaseun Sangoleye (Lagos) and Toviho Sefinrinmi (Lagos). Accessing Larger Supply Chains, facilitated by Sadiq Usman, Non-Executive Director & Deputy COO (Agro-Allied), Flour Mills of Nigeria (FMN) Plc. Am I Enough, facilitated by Mohammed Garuba, Partner & MD, CardinalStone Partners Limited, who facilitated the session. 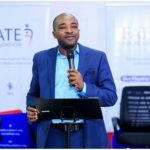 Edobong Akpabio, CEO, Visionage Agrotech Farms Ltd. who was the Course Director for the 2018 ScaleUp Agribusiness Accelerator Programme and is also an advisor and mentor to our Agribusiness entrepreneurs. AfricanFarmer Mogaji, Owner, X-ray Farms Consulting, for his exceptional advisory and mentoring support to our agribusiness entrepreneurs during the accelerator programme. 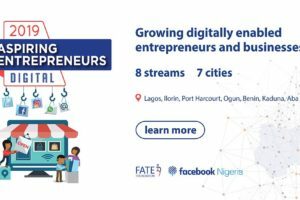 Post programme, the top ten (10) entrepreneurs will be enrolled in a 12-month sector-specific mentoring programme as they implement their growth plans to scale, and they will be officially graduating at the FATE Annual Celebration coming up on Wednesday, November 28, 2018.